It’s hard to imagine someone telling Omar Hakim that he doesn’t play enough solos. To be fair, the importance of a drummer isn’t limited to simply carrying the rhythm. Still, it isn’t necessary for a good drummer to solo in order to make an impact. Throughout his career, Hakim has done that numerous times, both as a sideman and as a leader. However, he has taken some flak for not playing enough solos. 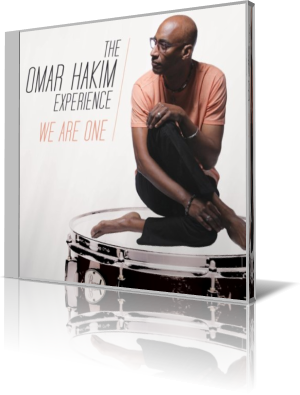 With that in mind, The Omar Hakim Experience presents We Are One (OZmosis Records, 2014). The album title can be taken as a testament to the group dynamic, or how people have a symbiotic relationship with other humans. Whatever the underlying message, the 10 original tracks – Hakim wrote or co-wrote each song – offer plenty of originality with stylish contributions from all players. The corps ensemble consists of Hakim, keyboardist Scott Tibbs, guitarist Chieli Minucci, bassist Jerry Brooks, keyboardist Rachel Z and harmonica player Gregoire Maret. Additional players contribute to a few tracks. Hakim and Tibbs teamed up to write the funky “Transmigration.” Brooks’ bass line helps set the mood. This is a group effort all the way. Hakim’s dexterity lays the foundation, but all the other players make significant contributions, whether leading the rhythm, injecting a solo or filling the background canvas. Special mention must be made to Minucci and Rachel Z. Regardless of which instrument is out front at a given moment, there’s always a sense of movement. Hakim splits time between the electronic V-Drums and the acoustic kit. “With Every Breath” is an electric, yet haunting ballad. Hakim plays drums, electric piano, keys, bass guitar and percussion. Minucci has the lead, with Tibbs and Rachel Z providing additional synths. Jimi Tunnell steps in with the ethereal electric guitar solo. This one is good for the romantics – excellent for slow dancing. Saxophonist Bobby Fracheschini helps put on the finishing touches. Hakim licks his chops big time on “Listen Up!” Maret handles the melody on this bouncy groove, with Tibbs, Minucci and Brooks completing the cast. Guitar and harmonica join for a duet on the second pass and subsequent bridge. Then follows a series of brief solos by piano, harmonica, guitar and harmonica. Then the entire ensemble heats up before all stop. Hakim shifts into overdrive, lighting up the entire kit. After the first few licks, the group comes in, intermittently, with the main phrase – sort of a response to Hakim’s calls. The mood then shifts back to the theme before the emphatic conclusion. Hakim has performed or recorded with many artists of various genres. Among them are Weather Report, Miles Davis, Madonna, Sting, Dire Straits and David Bowie. He has been in such demand that his solo projects have been limited. We Are One is only his third such outing.